Are We Headed For a Double Dip? A fresh batch of weak economic news Thursday heightened concerns about the staying power of the fledgling recovery, with more uninspiring news expected Friday when the government reports on the May job market. for the economy, said Ken Matheny, a senior economist at Macroeconomic Advisers, a forecasting firm based in St. Louis. A few weeks ago, I noted that our recession warning composite was on the brink of a signal that has always and only occurred during or immediately prior to U.S. recessions….What prompts my immediate concern is that the growth rate of the ECRI Weekly Leading Index has now declined to -6.9%. 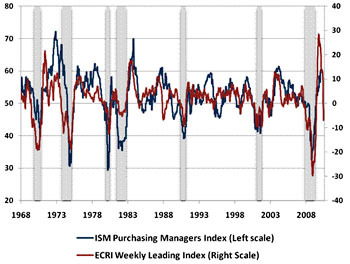 The WLI growth rate has historically demonstrated a strong correlation with the ISM Purchasing Managers Index, with the correlation being highest at a lead time of 13 weeks. ….Taking the growth rate of the WLI as a single indicator, the only instance when a level of -6.9% was not associated with an actual recession was a single observation in 1988. Great. And today’s lousy jobs report may put a few more folks in Hussman’s camp. Buckle your seat belts.